East End Arts : School : Celebrating 20 years of Education in the Arts in 2015! Happy 20th East End Arts! violins and cellos playing their parts. the members plan out their studio day. as they return each semester to experience more. the drummers rock, keepin the beat. and Tatiana the discipline, the skills that they need. the satisfaction of our students is not just a rumor. all integrated, whole, each are a part. would you like a receipt for that? gratitude goes out to everyone. 1995 :: East End Arts assumes the management of the Eastern Suffolk School of Music, now known as the East End Arts School, housed in the Benjamin House and expands programming to include the visual arts, theatre instruction and summer camps. 1996 :: First year of the Community Mosaic Street Painting Festival, now a signature event that raises money for scholarshipships at the East End Arts School. 2002 :: Teeny Awards begins celebrating excellence in high school theater across the East End of Long Island. 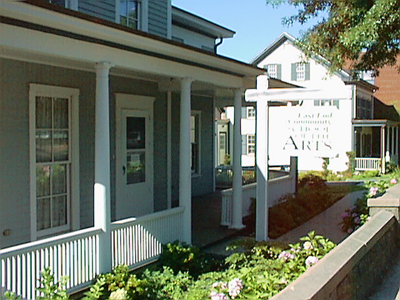 2007 :: East End Arts Carriage House is renovated and takes on a new life as a working studio complex and artist residency to accommodate the growing program offerings, thanks to the support from Senator Ken LaValle, Assemblyman Fred Thiele and Assemblywoman Pat Acampora. 2011-present :: East End Arts Student Orchestra is formed with the opportunity for Long Island music students to rehearse under the baton of world-famous Maestro Itzhak Perlman and alongside the Perlman Music Program student orchestra. 2015 :: The East End Arts School celebrates 20 years of education in the arts with an on-campus birthday bash and a faculty & student concert. 2015 :: Fresh Pond Schoolhouse is renovated and transformed into a multi-use community space for small events.